If diamonds are your best friend then these gorgeous earrings from Ross-Simons must be your soul mate. You’ll turn heads wearing these earrings that are set in platinum and weight in at 1ct weight total. Speaking of which, why are diamonds a girls best friend, but a dog is man’s best friend. Sounds like the ladies have the right idea on this one, since you could sell your diamonds and buy a dog, but no one is going to trade you a shiny ring for your old mutt. I’ve personally got more dogs than I do diamonds. I’ve got a story about a diamond that still haunts me to this day. A few years after getting married, my husband and I were avid fisherman, or is that fisher-people? Anyways, hubby always griped at me for wearing my diamond wedding ring on our fishing trips, but I ignored him, naturally. I just couldn’t dream of taking it off. So one day after we returned from a trip we were unpacking our gear and one of our ropes got wrapped around my hand, and unwittingly pulled tight. I’m lucky I didn’t just completely lose a finger. But when I got the rope free and looked at my hand, I could see that one of the prongs that held the diamond in my wedding ring had been bent. I called my hubby over to show him. I was determined to just take it off and put it up, but he insisted on having a closer look. Right as he reached out and barely touched the ring, as if under some spring loaded tension, the diamond shot out of the setting into our yard. We were mortified. We spent the entire rest of the daylight looking over every blade of grass, sectioning off the area we thought it had sprang out too, but to no avail. As the darkness fell I felt really hopeless, but we got out flashlights and continued to look, sure that the light would reflect back and make it easy to find. It didn’t, and we never found it. For days and weeks to come, we would go out and search that little section of yard in larger and larger swathes searching for the diamond but after about a month, we finally called off the search. For the next 30 years, he blamed me for wearing my ring out fishing as he had constantly warned me not too, and I blamed him for trying to touch it when I noticed the setting was bent. Either way, it was gone, forever. We replaced it with a fake diamond ring because we couldn’t afford a real new diamond. Even when we could afford a diamond years later, I had grown accustomed to the fake diamond and we just never replaced it. I know, it’s a pretty depressing story, but it’s a true one. Just like they say in slightly different words, “stuff happens”. I’ll bet I’m not the only one with a jewelry mishap. Whether you lost a ring or other jewelry piece or precious gem, or you’re just wanting to look like a queen and feel like a princess, you should enter for your chance to win this contest from Ross-Simons. I sincerely hope one of my loyal fans or subscribers is the lucky winner. Let me know in the comments below if you’ve ever lost a ring, earrings, or necklace. At least I’ll know I’m not alone! 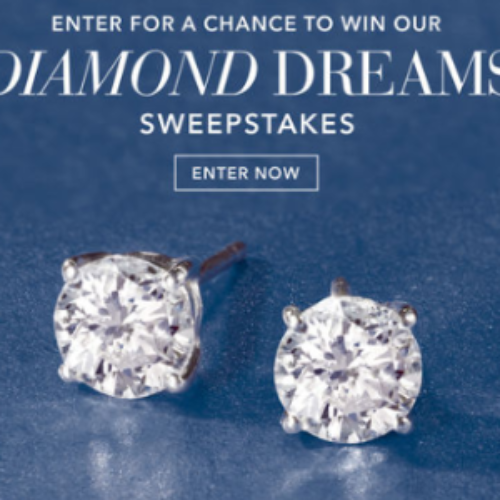 I want to Win Diamond Earrings from Ross-Simons for my wife. Yes I lost a gold necklace that had a diamond pendant on it I was really crushed as I had bought the diamond pendant and broke the chain I had for it and replaced the chain but, that broke also I was really sad as I was left the money by someone I knew and had bought the necklace with the diamond and earrings to match.